1st Step--1673. Estimated population: 50. This is the date Marquette first explored the Chicago portage area (he was the earliest known European to see the region). This step shows a map of the Chicago portage along with Mud Lake, a section of Lake Michigan, and the inhospitable marshes that made permanent settlement nearly impossible. The map is modeled after French explorers’ portage maps. 2nd Step--1779. Est. pop: 100. This is a scene of Jean Baptiste Pointe Du Sable’s cabin and trading post, as well as the land around the mouth of the Chicago River at Lake Michigan. The mosaic, inspired by a Raoul Varin engraving, shows the land’s lushness--and isolation. 3rd Step--1848. Pop: 20,000. This step is a diagram of the canal in Bridgeport at the time of its opening. The diagram shows the canal divided into two branches: the upper branch is the main canal where the boats traveled; the lower branch is the supply channel. Also shown is the pumping station that pumped water into the supply channel, maintaining the water level. 4th Step--1870. Pop: 300,000. The scene is a bird’s-eye view of the Chicago harbor in the year before the great fire. Inspired by a Theodore Davis engraving, the dense buildings around the river’s mouth stand in contrast to the view of DuSable’s cabin just nine decades earlier. 5th Step--1998. Pop: 2.8 million. This step is a section of a map of Bridgeport today, showing diagonal streets that depart from Chicago’s grid. The original canal location is still apparent from the angle of the streets that run parallel to the waterway. 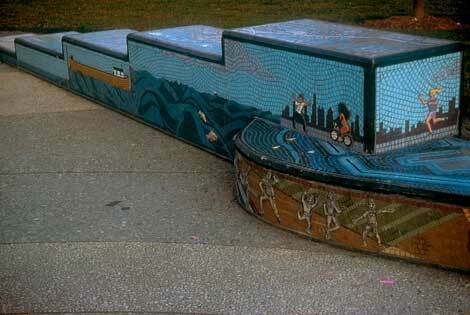 The curved section of the bench’s seat depicts an aerial view of Navy Pier and Lake Michigan. The clay figures on the vertical skirt were made by youths in Bridgeport and by volunteers in Morris. The figures, shown enjoying the park, represent the hope that the future will bring more greening and open land to Chicago.